Pacific Energy Company was founded in 1980 to provide an energy choice for rural and urban central coast residents. Recognizing the need for a complete retail resource of solar electric equipment, efficient wood stoves and fireplaces along with expert installation service, John Ewan & Troy Spindler opened the doors to San Luis Obispo County’s first renewable energy store. While installing solar hot water systems in the early 80’s, the company’s first solar electric deep well water pumping system was installed in the Creston area of San Luis Obispo County, California. While that system was cobbled together from the shelves of suppliers across the country, today’s mature industry offers complete engineered systems from major national and international manufacturers. Pacific Energy Company provides solar electric equipment from the finest manufacturers in the US and the world, specializing in products made in America. Our depth of experience in both the design and installation of solar electric systems for independent (off grid) living, water pumping & recreating is unmatched in San Luis Obispo County and makes PEC the choice for quality and reliability. Complementing our Solar Electric department are today’s re-engineered hearth products, with modern wood burning fireplaces emitting 95% less particulate matter (smoke) than older open hearth fireplaces. Gas fireplaces and stoves have been designed to efficiently heat while providing the ambience of a wood fire, and grown to be the hearth product of choice. Pacific Energy Company has been a leader in the introduction and promotion of these new products, working with industry and regulators to ensure San Luis Obispo County’s skies stay clean and clear. Our showroom displays and specializes in the latest clean and efficient technology, providing the finest in beauty and function. To this array of hardware we add the knowledge and experience of a Certified Energy Analyst. John Ewan provides T-24 analysis for architects and home designers throughout the Central Coast and California, with and eye toward efficiency, practicality and long term affordability. Located at the same address since opening day, PEC has expanded into the largest showroom in San Luis Obispo County of solar electric equipment, fuel efficient gas and clean burning wood: fireplaces, inserts and stoves. Our offices are powered by a Grid-Tie Solar Electric system (since 1999), all office & packaging waste is separated and recycled, office equipment and appliances are Energy Star compliant, errands are run on our “solar powered” electric scooter and local non profits are supported by our Solar Trailer (MPU) powering bands at fund raising events. The PEC staff and partner contractors are long term team members, demonstrating their commitment to PEC goals and business practices and Pacific Energy Company’s commitment to, and personal support of, them. 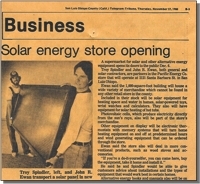 Today John Ewan and the Pacific Energy Company staff of Susan Mullen (1995), Stefan Tilleux (1995) and Joe Ryan (2011), along with the finest installing contractors of Hearth and Solar products anywhere, continue the tradition of providing expert advice and the finest products available to the residents and businesses of our beautiful central coast. Visit Pacific Energy Company today – because experience matters!